Analysis: Thompson, while still speedy, is primarily a depth receiver at this stage of his career and caught only 17 balls for 161 yards and no touchdowns last season. The Bills like him enough that they've had him for three different stints, but he'll be 30 next month and may be phased out as the team continues to rework the position group. At best, he'll end up as a No. 4-5-6 receiver in 2019. Analysis: Thompson missed each day of practice this week. The Florida product sustained the injury during last week's loss to the Patriots. In Thompson's absence, Da'Mari Scott, Victor Bolden and perhaps even rookie Ray-Ray McCloud could see increased workloads. 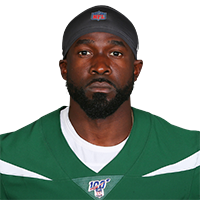 Analysis: It's looking pretty slim the veteran will play in the Bills' season finale, which would perhaps give rookie Ray-Ray McCloud a few looks as a depth option in the team's offense after being a healthy scratch for several weeks this season. Analysis: After exiting the Week 16 loss to the Patriots with the toe issue, Thompson will probably need to make it back to the practice field in some capacity Thursday or Friday to have a shot at suiting up in Sunday's season finale against the Dolphins. If active for the contest, Thompson would likely rank as nothing more than the Bills' No. 4 option at wideout, a role that wouldn't lend itself to much fantasy utility. Analysis: The severity of Thompson's toe injury is not yet known. With Thompson temporarily sidelined, Da'Mari Scott and Victor Bolden could see a small increase in workload. The Bills signed Thompson to a contract Wednesday. The Cowboys released Thompson (ribs) on Friday, David Helman of the Cowboys' official site reports. Analysis: After inking a deal with the Cowboys in March, Thompson was beset by Achilles and shoulder injuries during the offseason program and preseason, released on cut-down day Sept. 1, and re-signed three days later when Noah Brown (hamstring) was placed on IR. Dallas activated Brown to the 53-man roster Friday, which necessitated a roster move. Thompson was the casualty, ending his Cowboys tenure with 14 catches (on 20 targets) for 124 yards and no touchdowns in eight games. Thompson (ribs) was a limited participant in Thursday's practice, David Helman of the Cowboys' official site reports. Analysis: Thompson was unable to practice to begin the week, so his limited participation is a step in the right direction. The depth wideout continues to progress in his recovery from a rib injury sustained during a Week 9 loss to the Titans, and he should be considered questionable for Sunday's matchup against the Eagles. If Thompson is unable to suit up, Jourdan Lewis will serve as the Cowboys' top kick returner. Thompson didn't practice Wednesday due to a hip injury, Jon Machota of The Dallas Morning News reports. Analysis: Thompson likely picked up the injury in Monday's 28-14 loss to the Titans. He only played three offensive snaps in that contest, but was targeted on two occasions, reeling in both looks for 21 yards. If Thompson is able to shake off the injury and play Week 10 against the Eagles, he'll likely be no better than the fifth option at receiving for the Cowboys behind Amari Cooper, Cole Beasley, Michael Gallup and Allen Hurns. Thompson failed to convert his only target into a catch during Sunday's 20-17 loss to Washington. Analysis: Thompson has now been catchless in two of his last four games and hasn't reached 20 yards in a single contest since Week 3. Things aren't likely to get better after the bye. Not only does Dallas take on a pesky Titans pass defense ranked eighth in passing yards per game at 226, but new acquisition Amari Cooper figures to vacuum up whatever limited looks Thompson was receiving on offense. Thompson (hamstring) is active for Sunday's game against the Jaguars, Calvin Watkins of The Athletic reports. Analysis: Thompson has totaled just six targets the past three games, hasn't surpassed 33 yards receiving in a given game this season and has yet to record a touchdown as a Cowboy. To make matters worse, he's taking on a Jacksonville defense that ranks first against the pass (191 yards per game). Thompson was added to the injury report Friday with a hamstring injury and listed as questionable for Sunday's game against Jacksonville, Jon Machota of The Dallas Morning News reports. Analysis: Given his role as part of a wideout committee in a struggling offense, Thompson won't hold much appeal even if he's cleared to play. He's caught 11 of 16 targets for 102 yards through five weeks while handling a 47 percent snare. A Week 6 absence would free up a bit more work for Michael Gallup and Tavon Austin. Thompson caught both of his targets for 23 yards during Sunday's 24-13 loss to Seattle. Analysis: Thompson has settled into the No. 2 receiver role in a Dallas offense that ranks 31st in the league in receiving yards. The veteran has yet to tally 35 yards in a game and doesn't figure to see much of an improvement against Detroit's top-ranked passing defense. Thompson caught four of five targets for 33 yards in Sunday night's win over the Giants. Analysis: For the second straight week, Thompson saw five targets from Dak Prescott, and he was actually the Cowboys' most-targeted wide receiver this time around. His longest reception went for only 12 yards, however, and until offensive coordinator Scott Linehan commits to adding a more vertical element to the team's passing game, Thompson's developing chemistry with Prescott still won't provide him with much fantasy value. Thompson caught three of five targets for 27 yards in Sunday's loss to the Panthers. Analysis: All five of the targets came in the fourth quarter on Dallas' final two possessions, when the team was mounting a desperate comeback bid. 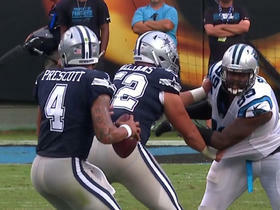 Thompson's absence from the game plan outside of the two-minute drill suggests he'd need an injury or two above him on the depth chart to have any significant fantasy value, but given the general futility the entire passing game showed in Carolina, his little flicker of late chemistry with Dak Prescott could be enough to earn him a larger role Week 2. Thompson signed a contract with the Cowboys on Monday, Jon Machota of The Dallas Morning News reports. Analysis: Thompson was initially part of the team's cuts Saturday, but the placement of Noah Brown on injured reserve has reopened a spot for him. The veteran wideout should provide some depth at wideout for the Cowboys after totaling 38 catches for 555 yards and two scores last season. The Cowboys released Thompson on Saturday, Jon Machota of The Dallas Morning News reports. Analysis: Thompson was brought in before Dez Bryant's release in mid-April, but the veteran wide receiver was unable to take advantage of the situation, missing a portion of the offseason program, training camp and the preseason due to injuries to his Achilles and shoulder. With his health perhaps still in question, the Cowboys will ride Allen Hurns, Terrance Williams, Cole Beasley and rookie Michael Gallup to start the season. Thompson (Achilles) returned to practice Friday, Jon Machota of The Dallas Morning News reports. Thompson (Achilles) is expected to return to practice Thursday, Jon Machota of The Dallas Morning News reports. Analysis: Thompson has been sidelined for most of training camp due to a string of different injuries. The 29-year-old's return to practice could help his chances of playing in Sunday's dress rehearsal game. Thompson will need to make up for time lost if he hopes to retain his spot as the team's primary kick returner. Thompson (Achilles) is participating in team drills at training camp, Bryan Broaddus of the Cowboys' official site reports. Analysis: Thompson was sidelined at June's minicamp due to a combination of Achilles and shoulder injuries. However, the receiver's participation in team drills suggests he's since received medical clearance to participate in football activities. Thompson is competing with Cole Beasley, Michael Gallup and Tavon Austin for slotting on the depth chart under Terrance Williams and Allen Hurns. Thompson is being held out of mandatory minicamp Tuesday due to injuries to his Achilles and shoulder, Clarence E. Hill Jr. of the Fort Worth Star-Telegram reports. Analysis: Thompson signed a one-year deal with the Vikings this offseason after having a career-best year in 2017. Given that the Cowboys are fairly light on depth at wide receiver, chances are any injury won't affect Thompson's roster standing for the upcoming season, but he does have a real opportunity to carve out a legitimate role in the passing game with an impressive offseason. It's unclear, however, how serious these injuries are at this time and how long Thompson will be out. Thompson has signed a one-year, $2.5 million deal with the Cowboys, ESPN's Todd Archer reports. Thompson, an unrestricted free agent, has drawn interest from the Bills, Broncos and Cowboys, Mike Garafolo of NFL Network reports. Analysis: The speedy 29-year-old enjoyed a career year in 2017, catching 38 of 69 targets for 555 yards (8.0 per target) and two touchdowns in 16 games for the Bears and Bills. Thompson may find a shot to compete for a No. 3 receiver job, but he's more likely to settle for No. 4/5 slotting and a potential role as a kickoff return man. A reunion with the Bills would provide the easiest path to a major role on offense. Thompson (shoulder) brought in two of six targets for 23 yards in Sunday's 10-3 AFC wild-card loss to the Jaguars. Thompson (shoulder) is listed as active for Sunday's playoff game against the Jaguars. Analysis: With the Bills' spotty passing attack matched up against Jacksonville's rugged defense, Thompson -- whose production down the stretch was sporadic -- profiles as a hit-or-miss fantasy option Sunday. Thompson (shoulder) is listed as questionable for Sunday's playoff game against the Jaguars after practicing in a limited fashion both Thursday and Friday. Analysis: Thompson should be good to go Sunday, barring any unexpected setbacks, but the Bills' inconsistent passing attack faces a tough challenge against Jacksonville's rugged defense, so the wideout profiles as a hit-or-miss fantasy option this weekend. Thompson (shoulder) participated in Thursday's practice, Chris Brown of the Bills' official site reports. Analysis: The exact capacity Thompson was able to participate in won't be known until the Bills release their official practice report, but after sitting out Wednesday's session, Thompson looks to be trending in the right direction heading into the weekend. Another practice Friday would bode well for Thompson's status for Sunday's playoff game in Jacksonville. Thompson (shoulder) won't participate in Wednesday's practice, Chris Brown of the Bills' official site reports. Analysis: Thompson injured his shoulder in a practice last Thursday and ended up playing in Buffalo's regular-season finale against the Dolphins, so the assumption is that the Bills are managing his pain ahead of Sunday's playoff game against Jacksonville. Thompson's return to at least a limited practice Thursday or Friday would give more credence to that thought, however. Thompson (shoulder) is listed as active for Sunday's game against the Dolphins. 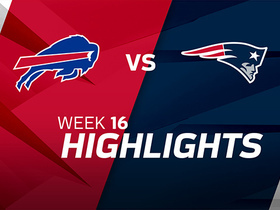 Analysis: Thompson caught four passes for 91 yards in Week 16's loss to New England, so as long as his shoulder holds up, the wideout could make a mark in Sunday's contest, with Kelvin Benjamin playing through a knee issue and Zay Jones having faded of late. 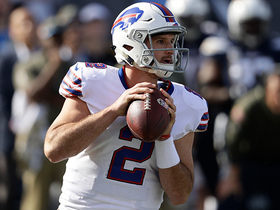 Thompson, who suffered a shoulder injury during Thursday's practice, will be a game-time decision for Sunday's finale in Miami, Mike Rodak of ESPN.com reports. Analysis: If Thompson is able to practice on a limited basis Friday that may put him on the better side of questionable. He did catch four balls for 91 yards in last week's loss to New England and could be somewhat active in the game plan given Kelvin Benjamin's continued pain in his knee and Zay Jones falling off the map lately. However, the Bills play at 4:25 ET in the last wave of games, so counting on an unhealthy, lower-tier fantasy receiver could prove too risky for some. 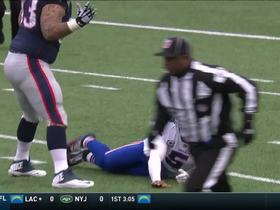 Thompson suffered a shoulder injury during Thursday's practice, Mike Rodak of ESPN.com reports. Analysis: Head coach Sean McDermott noted afterward that Thompson is "still being evaluated," which suggests that the wideout could possibly be in danger of missing Sunday's game against the Dolphins. If Thompson is limited or out this weekend, Zay Jones would presumably be in line for added opportunities. 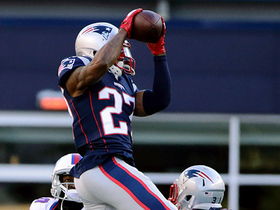 Thompson hauled in four of five targets for 91 yards in the Week 16 win over the Patriots. Thompson (back) practiced fully Thursday. Analysis: Thompson is thus slated to be available for Sunday's game against the Patriots, but he's coming off consecutive one-catch efforts, so he's only a Week 16 fantasy dart in the deepest of formats. Thompson (back) was limited at practice Wednesday. Analysis: We'll track Thompson's status leading up to Sunday's game against the Patriots, but given that he's logged consecutive one-catch efforts, he's not a high percentage fantasy play in Week 16, in any case. Thompson was targeted four times during Sunday's win over Miami, hauling in just one pass for 16 yards. Thompson brought in his only target for 34 yards in Sunday's 13-7 overtime win over the Colts. Analysis: Thompson logged the longest reception of the game for either team, although it was his only catch of the afternoon. The veteran is projected to have a larger role for the final three games of the season with Jordan Matthews (knee) now on injured reserve and Kelvin Benjamin also having exited Sunday's game early with yet another knee injury. Thompson was targeted a team-high eight times during Sunday's loss to the Patriots but only hauled in two passes for 21 yards. 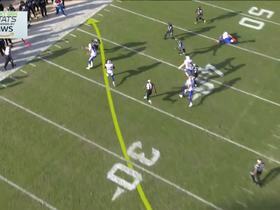 Analysis: Thompson payed 82 percent of the offensive snaps, as the frequent three-wideout sets the Bills used allowed for Zay Jones, Thompson and Jordan Matthews to all get 76 percent or more action. Thompson's high level of offensive activity will drop when Kelvin Benjamin (knee) returns, however, and with just four receptions over the last four games, he's not worthy of ownership at this time. Thompson caught one of two targets for six yards in Sunday's win over the Chiefs. Analysis: Thompson actually saw more offensive snaps (56) than the normal starting wideout, Jordan Matthews (42), but didn't do much with them. As the No. 3 receiver who will end up being the No. 4 when Kelvin Benjamin (knee) returns, there's not enough consistency to be had, especially when you consider the Bills have a lousy passing offense, one that's completed just 86 passes to wide receivers all season. Thompson (ankle) is listed as active for Sunday's game against the Chiefs. Analysis: With Kelvin Benjamin (knee) inactive Sunday, Thompson figures to move up to third in the pecking order at wideout behind Jordan Matthews and rookie Zay Jones. While that's an assignment that doesn't carry much bankable upside -- considering the Bills' season-long passing struggles -- it's possible that Thompson could break off a big play or two Sunday, particularly if Buffalo falls behind in the contest. Thompson (ankle) is expected to be active for Sunday's game against the Chiefs, a source informed Adam Schefter of ESPN. Analysis: Thompson is listed as questionable after the ankle injury limited him in practice this week, but it doesn't look to be anything that will prevent him from suiting up. Look for him to serve as the Bills' No. 3 wideout in Week 12 with Kelvin Benjamin (knee) sidelined, though that role seems unlikely to afford Thompson much volume in the passing game. Thompson's teammate Kelvin Benjamin (knee) has been ruled out for Sunday's game in Kansas City, while Thompson (ankle) is likely to play after practicing on a limited basis all week. Analysis: Assuming Jordan Matthews (knee) suits up, that would push Thompson to the No. 3 role, with rookie Zay Jones serving as the No. 2. There's not much face value in that three spot given the Bills' passing struggles all season, but Thompson could pop off a big gain or two, especially if the Bills end up playing from behind again. He'd likely serve as a starter if Matthews suffered a setback between now and kickoff. Thompson (ankle) practiced on a limited basis for the third straight day Friday and is listed as questionable for Sunday's game against the Chiefs. Thompson was limited at Wednesday's practice due to an ankle injury. 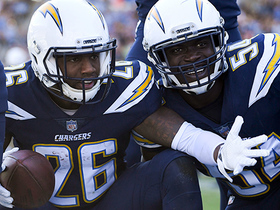 Analysis: Thompson was injured in the second half of Sunday's 54-24 loss to the Chargers, finishing with three catches for 36 yards on a team-high eight targets. Assuming the ankle issue isn't serious, he could take on an expanded role Sunday in Kansas City, as Kelvin Benjamin (knee) was unable to practice Wednesday and is considered day-to-day. 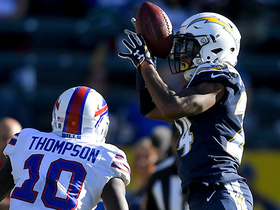 Thompson (undisclosed) caught three passes for 36 yards on a team-high eight targets in Sunday's 54-24 loss to the Chargers. Thompson continues to see work with the starting offense, even with the addition of Kelvin Benjamin. The veteran saw 39 offensive snaps in Sunday's loss to the Saints while catching just one of four targets for 10 yards. Thompson brought in seven of 10 targets for 81 yards and a touchdown in Thursday's 34-21 loss to the Jets. 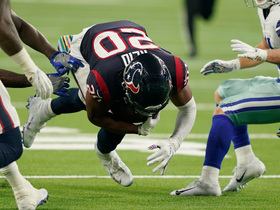 Houston Texans safety Justin Reid squeezes ball on a finger-tip interception from Dallas Cowboys quarterback Dak Prescott. 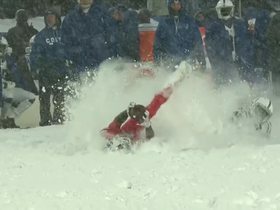 Buffalo Bills wide receiver Deonte Thompson takes end-around for 9 yards and a first down. Buffalo Bills quarterback Nathan Peterman throws his 4th interception of the first half.